Christie's. December 2003. Egyptian wooden figure. 12 ¾ inches high. Middle Kingdom, Dynasty XII. It sold for $16,730. Christie's. June 2005. 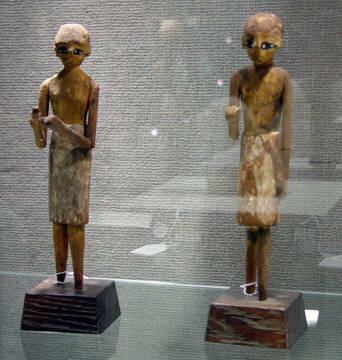 Pair of wood figures, Egyptian, Middle Kingdom, Dynasty XI-XIV, 2040-1640 B.C. 10 5/8 inches high. It sold for $9,000.